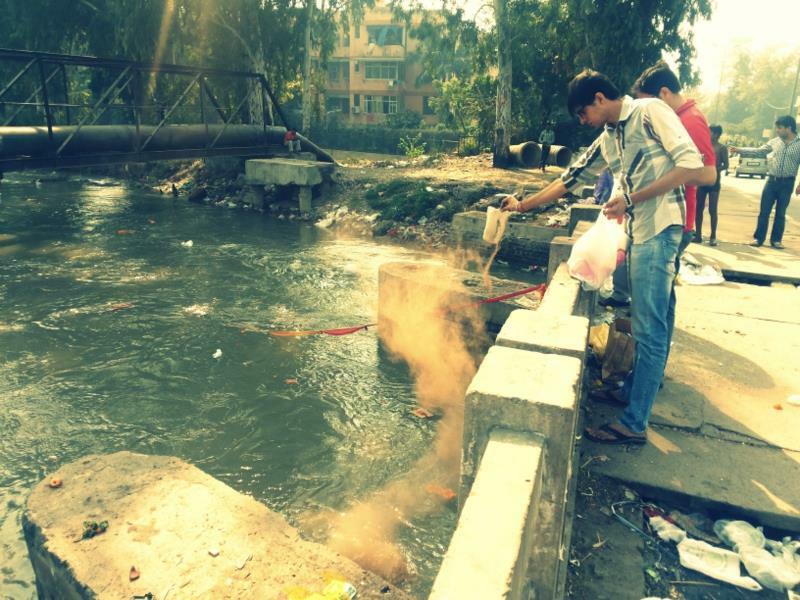 A Hindu devotee empties vibhuti into a stream in Rohini, New Delhi. The four of us looked completely ridiculous carrying a 10-foot tall bamboo staff draped with a canvas rag bearing the ubiquitous #NoKXL hash-tag onto the Metro. But after marching through L'Enfant's D.C. maze shouting slogans at the top of our lungs, standing in the rain for several hours, and watching our friends get arrested at the White House fence in record numbers, it was safe to say that none of us really worried about that. 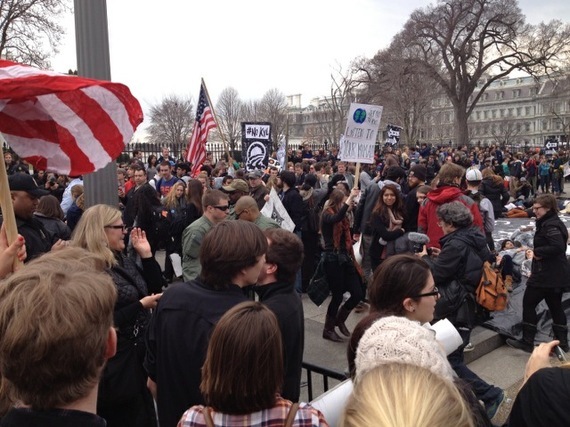 I didn't really know the other three -- we'd just met at the XL Dissent protest in front of the White House, an act of civil disobedience against the final leg of the Keystone XL Pipeline in which youth were arrested for zip-tying themselves to the White House fence and enacting a mock oil spill. All of us happened to be en route to the same location: a church where we'd await the arrival of our fellow companions that had been arrested. As I took my seat and began talking to Shannon from Guilford College, something she said suddenly struck me. She talked of going to an eco-activist training session in which environmental activism was approached through the lens of yoga and kīrtan. Unfortunately, the train ride was too short in order for all of the questions swirling around in my head to be answered concretely. How does yoga relate to environmental activism -- in both the purely physical and in the spiritual sense? Is kīrtan a tool for energizing people to action through musical beats or does it serve a much deeper purpose for these eco-activists? But, there is one question that impelled me into much more serious rumination: if eco-activists are using the explicitly Hindu practices of yoga and kīrtan as means of expressing the eco-activist program, why is Hinduism on the ground seemingly so devoid of activism? But before I tackled this question, I needed to know what serious and specific role, yoga and kīrtan played in the U.S. eco-activist movement. A cursory Google search provided a wealth of disparate answers. Kelly Martin, of the Sierra Club's "Beyond Coal" campaign and self-identifying yogi noted that yoga and eco-activism share an important overlap in their analogous emphases on improving the well-being of the body and of ensuring a healthy future for communities. Another organization that has explored this overlap widely is Jivamukti Yoga, which interprets the Sanskrit word and yoga buzz term āsana, "seat" (lit. from aste, he sits) as a relationship with the Earth (upon which one sits). The organization is centered on the verse sthira sukham āsanam (2.46, Pantajali's Yoga Sutras) in inveighing that one's relationship with the Earth should be sustainable (sthira, lit. stable) and mutually beneficial for all stakeholders, including the non-human ones (sukham, lit. happiness). Thus, at Jivamukti centers, yoga and kirtan often accompany talks on veganism and the need for climate justice. So, we might attempt to explain away the lack of environmental activism in traditional Hindu practice by arguing that yoga and kīrtan, as used within these environmental movements, are merely means of improving physical health and do not make adequate reference to, for instance, bhkati in order to qualify as "really Hindu" (whatever this means). In this view, the comparison itself is misleading -- why would Hinduism use yoga and kirtan to espouse an environmental program if the Hindu concept of yoga and kirtan diverges significantly from that practiced by these organizations? Of course, this explanation is far too dismissive. Even if we accept that this is the case for the Sierra Club, the example of Jivamukti poses a far greater challenge, for its philosophy seems to gel quite nicely with the Vedic emphasis on paying homage to various aspects of nature and the ideal of ahimsa toward all beings encapsulated by the Mahabharata. And of course, yoga and kirtan are not the only ways to approach environmental activism from a Hindu perspective, anyway. One of the most vivid examples of Hindu eco-activism is that of Vandana Shiva, prominent anti-GMO activist and author of Soil Not Oil, Water Wars, and Earth Democracy. When asked by Bill Moyers, "What drives you, really?," Shiva replies, "There is a very simple lesson that Kṛṣna gives [in the Bhagavad Gita], 'You do not measure the fruit of your action; you have to measure your obligation for action. You have to find out the right thing to do. That is your duty.'" Indeed, during her various battles against patenting and privatization against Coca Cola and Monsanto, Shiva has repeatedly referred to both her Hindu heritage and close-to-nature upbringing as sources of inspiration for her activism. One of the "obligation[s] for action" so often referred to in Hinduism is to fight against adharma -- that which is not in accordance with basic principles of law, ethics, or duty. The more I think about it in retrospect, the more I become convinced that this is how I thought about my decision to join the protest against the Keystone XL Pipeline. After all, what could be more adharmic than incentivizing the creation of fossil fuel infrastructure that only makes oil a more economically viable means of energy production, thereby impeding progress on combating global climate change? What could be more adharmic than drilling for oil that contributes 17 percent more greenhouse gases to the atmosphere per unit production? What could be more adharmic than displacing Native peoples for economic profit -- not distributed to the public or in the interest of job creation -- but concentrated in the hands of a few? The pipeline represents at best an economically irresponsible endeavor based on petroleum market forecasts, and at worst, a choice with disastrous consequences for the environment. I have often been asked what will come of the action that was taken in Washington, D.C. on Sunday, the suggestion being that, in the end, such protests have little hope of reversing the pipeline of policymaking. To give an answer that invokes the very basic principles of the Gitā, this is not at all my concern. To suggest that we should only bet on a "winning horse," drains us of our principles and of our faith. It turns us into automatons in a game theoretic desert. If you see something out there in the world that defies righteousness, it becomes your duty to speak out. Take action. As one of my friends so eloquently put it, "If they're going to do something absurd like pursue an all-of-the-above energy policy, I'm going to do something absurd like chain myself to a fence." I can't say that I emerge from my experience at XL Dissent with no qualms about the method of protest, but these qualms are shortchange compared to my qualms about the irresponsible decision-making that happens around and, to not be too moralizing, within myself each and every day. With due deference to all of the Hindu activists out there, perhaps the reason why Hinduism has failed to develop a truly vibrant environmental movement beyond animal and river protection is that we have collectively failed to see climate change as one of the most insidious rakshasas of modern times -- a Putana that sells a vision of cheap economic development with hidden environmental costs mixed in as poison. With all of the tenets of dharma suggesting the presence of an active preservationist current, its very absence may point toward the gradual sidelining of dharma as a theological construct inasmuch as it plays a vital role in the life of the average practitioner. If at all true, such a development is deeply worrisome for Hinduism itself.